"I choose Yamaha because it allows me to play with full confidence, knowing I can unleash my artistry with true passion and expression." 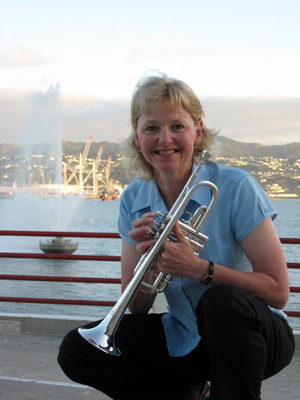 Cheryl Hollinger is currently associate principal trumpet of the New Zealand Symphony Orchestra. Cheryl first picked up a trumpet when she was in 5th grade and went on to gain a Bachelor of Science in Music Education at West Chester University in her hometown state of Pennsylvania. She won entry to The Juilliard School in New York City, where she gained her Bachelor of Music and Master of Music degrees. Cheryl has studied under Arnold Jacobs, Vincent Cichowicz and Adolph Herseth, all formerly of the Chicago Symphony Orchestra, and more recently has worked with David Bilger and Jeffrey Curnow from the Philadelphia Orchestra. Before taking up the job at the NZSO in 2000, some of her previous positions were with the Louisiana Philharmonic in New Orleans (principal trumpet), the Florida Symphony Orchestra (second trumpet), and the Savannah Symphony Orchestra (co-principal trumpet). As a soloist, Cheryl has performed with the Louisiana Philharmonic Orchestra, the Florida Symphony Orchestra, the Savannah Symphony Orchestra, the Hilton Head Orchestra, and the Suburban Symphony Orchestra and Kankakee Symphony Orchestra in Illinois. Cheryl has recorded with Nine Inch Nails, on the "The Fragile" album, and has played at several international events, including The Proms in London, the Aichi Expo in Japan, the Olympic Arts Festival 2000 in Sydney, with the Spoleto Festival Orchestra in both the United States and Italy, and at the Colorado Music Festival in Boulder. As well as her job with the NZSO, Cheryl is a member of New Zealand Brass and the Talisker Trio. She also teaches privately and through Victoria University, in Wellington.